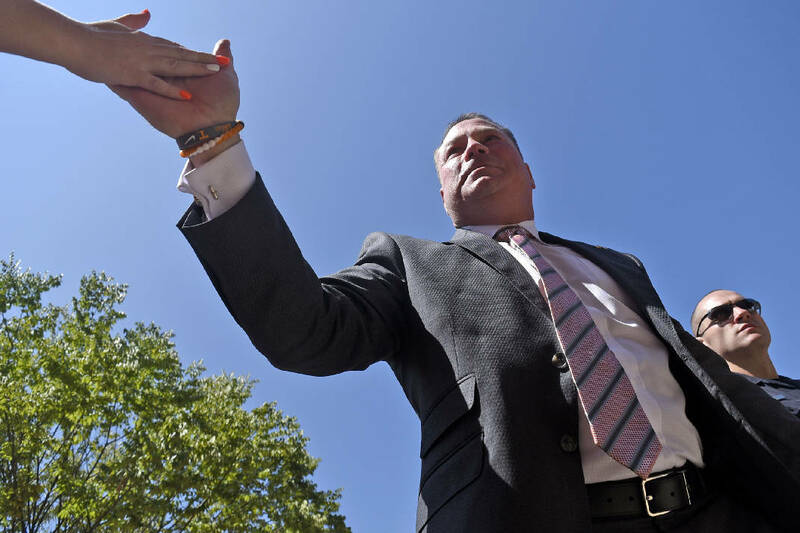 Tennessee head coach Butch Jones greets fans along the Vol Walk. The Indiana State Sycamores visited the University of Tennessee Volunteers at Neyland Stadium in NCAA football action of September 9, 2017. KNOXVILLE — Tennessee began the week by treating its fans to a heart-stopping double-overtime football victory over Georgia Tech. It gave them a breather Saturday — for the most part. The Volunteers did not altogether overwhelm Indiana State, but they handled their Missouri Valley Conference opponent with relative ease in a 42-7 home-opening victory. Tennessee freshman Ty Chandler returned the opening kickoff 91 yards for a touchdown, and the game was never tied again in front of 99,015 at Neyland Stadium. "I think the will to win obviously was demonstrated Monday night," Tennessee coach Butch Jones said, referencing the 42-41 win over Tech. "But then being a mature football team, you have a great win but put it aside and come back ready to play on a short work week." The Vols now turn their attention to SEC East rival Florida (0-1) and a scheduled trip to Gainesville this week coinciding with the aftermath of Hurricane Irma. "We have to get a lot better in a hurry," Jones said, "and we'll go back to work Monday." Tennessee will return to practice after reviewing video on two quarterbacks. Monday's starter, Quinten Dormady, played the first two series of Saturday's win, leading a touchdown drive on the second of them. Jarrett Guarantano made his collegiate debut on the team's third offensive series. The redshirt freshman from New Jersey went 0-for-3 passing on the first possession he directed. On his next series, he led a touchdown drive capped by a 30-yard run from sophomore running back Carlin Fils-aime, making the score 21-0 in the second quarter. "He had a very good week of preparation," Jones said of Guarantano. "I liked his mindset along with Quinten in terms of taking the mental reps when they weren't in. Again, any time you get repetitions, they're invaluable, even at the end of the game. Now you can go in and watch the video and really watch yourself and learn from it." Dormady returned late in the second quarter and put the Vols ahead 28-0 when he passed to sophomore Brandon Johnson for a 19-yard touchdown. Dormady fumbled and threw an interception on consecutive series to begin the second half as the Sycamores closed the gap to 28-7. The junior hit Marquez Callaway for a touchdown with 2:12 left in the quarter to make the lead 35-7. Guarantano played the rest of the game and ended the day's scoring with an 11-yard touchdown strike to Jeff George with under a minute left. "I thought they did some good things in terms of getting down to their second and third progressions," Jones said of the two quarterbacks. "But it's hard to see from the sidelines. I'll know a little bit more tonight and obviously Sunday. I thought we left some plays out there in the first half. But when you look at the efficiency throwing the football, I thought they did some good things." Dormady said the biggest challenge of the quarterback rotation was remaining loose as the temperatures cooled while a sunny afternoon turned to evening. "You stay locked into the game the whole time," Dormady said. Tennessee's defense recovered from allowing a school-record number of rushing yards to Georgia Tech by holding Indiana State without a third-down conversion. The Sycamores' score came after Dormady's fumble gave them a short field in the third quarter. "I thought one of the keys to the game was third-down defense and being able to get off the field," Jones said. "Obviously, it's our first SEC game," Dormady said. "It's a big one, going down to the Swamp. We've just got to focus on the now, get in tomorrow, watch the film, get that corrected and get right into Florida. "We've just got to go into execute, and if we do that we'll put ourselves in position to win the game at the end."